Lovelace Ackah can get under the skin of opposing target forwards. In fact, it's part of the Milwaukee Wave defender's job description. Witness this testimony from a frustrated Wes Wade, the Kansas City Comets' veteran forward. "He's just a hack," Wade said after the Comets' 7-3 league semifinal loss to the Wave last week. "He (Ackah) just kicks you the whole time and the referees allow that. So we have to adjust to that, and we didn't." Whatever opposing forwards call Ackah, he is a Major Indoor Soccer League all-star and one of the key performers for the Wave as it tries to regain the MISL title, beginning this weekend. The Wave will take on the defending champion Baltimore Blast in the best-of-five MISL Finals, opening Friday night at the U.S. Cellular Arena. Ackah has played in four consecutive title series with the Wave, winning crowns with Milwaukee in 2000 and 2001 and falling short by one game each of the past two years. He did not have a particularly memorable series against the Blast a year ago, when the Wave lost on its home field in the decisive third game. "We don't worry about what happened last year," Ackah said. "We don't want to think about it; we don't want to talk about it. "We've waited a whole year for it (a return to the finals)." Indeed, a few big things have changed for the Wave, including the departure of perennial goalkeeper of the year and two-time league MVP Victor Nogueira. But goalkeepers Dan Green and Nick Vorberg stepped in and played well, and the Wave's core group of defenders was unshaken. Ackah, Troy Dusosky, Pat White, Joe Hammes, Matt Schmidt and newcomer Chris Morman combined to make the Wave a tough team to score against, helped by the defensive work of Milwaukee's midfielders and forwards. "To be honest with you, I thought it was going to be a little bit that we're going to miss Victor," Ackah said. "But I don't think we did, because those guys stepped up, those two goalies. "And we're all the way to the finals again. Victor is an all-time great, everybody knows that. But there's a team working here." Ackah plays his part by marking the physical forwards on opposing rosters. His past playoff showdowns with 6-foot-7 forward Shawn Boney (of Cleveland and Philadelphia) qualified as great entertainment. In the upcoming series, he will go up against Baltimore's Chris Handsor, Tarik Walker and Chile Farias. "As Love knows, Joe Reiniger or Todd (Dusosky) or Kinger (Michael King) can change the rhythm of the game by scoring goals," Tozer said. "Love has the ability to change the rhythm and intensity of the game in the back. "He can do it not only through his defense, by shutting a guy down, but he also has the ability to do it by going forward. I see leadership qualities coming out of Love." Ackah, a 27-year-old native of Kumasi, Ghana, has settled down in Brookfield and assists with the Brookfield Soccer Club in the off-season. 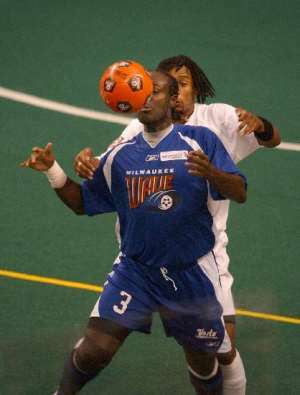 He is under contract to play outdoors with Milwaukee Wave United this summer, and Tozer said he has named Ackah to the pool of players for the U.S. national futsal team. "He could play indoor or outdoor; he's a soccer guy," Tozer said. "He revels in this and keeps improving every year." Ackah's temper has sometimes put him into trouble in the past, and he did receive a red card for an elbowing foul in a game this season. But Tozer believes the big defender (6-1, 195 pounds) has usually been able to control his emotions. "From below the shoulders, Love is an extremely talented individual," Tozer said. "He's strong, quick, with great ball skills. It was above the shoulders that was giving him a hard time the last couple years. "I'm talking about concentration level. The first year, out of 60 minutes, it might have been 45. This year he has been concentrating the entire 60 minutes. I think he's been focusing on playing within his own game, making sure there's no mental mistakes." Ackah knows the fine line he must tread between being physical and not letting his emotions boil over. "My first couple years, sometimes you're so excited," Ackah said. "When you do something (to get a red card), in the season you have another game to play. "But this is the finals. You have to look to win three games, and you don't want to do something."